It was on this day in 1785 that King Kamehameha I triumphed over his enemies to establish the Kingdom of Hawaii. 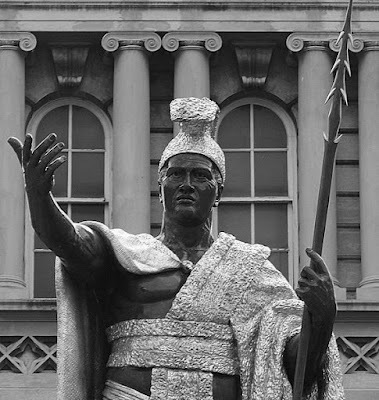 Is there a Monarchist/Independence movement in contemporary Hawaii? There is I believe but it is pretty miniscule. The heir to the throne has served in the U.S. government so I doubt he would support them. Since the Civil War it has been made abundantly clear that the Union is rather like the old I.R.A. "once in, never out". The problem is that the native Hawaiians are such a tiny minority on the islands now. -Which is why controlling immigration is essential people!! There is a pro-independence movement in Hawaii, but its fragemented into a bunch of different groups, all with differening messages and objectives. Many of them profess to be officially royalist, but each one endorses their own candidate to the throne, which invariably just happens to be the community activist founder of the organization in question, none of which have any actual, provable relation to the real Hawaiian royal family. Bottom line, as of now at least, independence/royal restoration in Hawaii is a total pipe dream. The legitimate heir to the throne, Prince Quentin Kawananakoa, does still actively use his title and participates in native ceremonies and traditions, but is a registered member of the Republican Party and has served as such in the state legislature and Congress and has professed his loyalty to the United States. The attitude of the Hawaiian royals over the years seems to have been one of learning to accept the things that have no hope of being changed, which is unfortunate, but certainly pragmatic. It is very much a shame what happened to that once-great kingdom, and a hugely embarassing black mark on American history. There is a profile on Prince Quentin for those who wish to check the 'labels' at the bottom of the post. Total independence is a pipe dream, it is sad to say, because most people in Hawaii have no connection (historical, ancestral, cultural) with the old kingdom. Only a tiny minority are Hawaiians, the vast bulk of the population came after the U.S. takeover and would simply have no reason to ever support such a thing. From the perspective of the how the real world works, I can understand why the U.S. would want to keep Hawaii out of the hands of any other power. However, it could have been done as an allied state or protectorate rather than annexing it, tearing down the monarchy and so on. However, as I said before, like it or not, the U.S. is "married" to the concept of "one nation, indivisible" and secession is unthinkable, impossible and not tolerated. Period. If I had my way, it would be different, but that's those are the facts. I think the only real hope for Hawaiian monarchism ended with Pricess Kaiulani's death (which I do blame on the likes of Dole, Thurston and the other "PGs" who took over and her own heartbreak). I don't think anyone else could have united what was still THEN a majority of native/part-native Hawaiians who were pro-monarchist (which is why the pro-American annextionists and even the US govt would not let the issue of annexation be decided by a majority vote in Hawaii). As it I think the way the US "acquired" Hawaii (a friendly nation) is one of the most shameful acts in US history and one often neglected in the history books.